For other uses, see Savage Island. The Savage Islands or Selvagens Islands (Portuguese: Ilhas Selvagens IPA: [ˈiʎɐʃ sɛɫˈvaʒɐ̃jʃ]) are a small Portuguese archipelago in the North Atlantic, 280 kilometres (175 mi) south of Madeira, and 165 kilometres (105 mi) north of the Canary Islands. The islands are also known in English as the Salvage Islands or Dry Salvages. The archipelago includes two major islands and several islets of varying sizes, in two areas: Selvagem Grande and Selvagem Pequena. The archipelago is administered by the Portuguese municipality of Funchal, belongs to the Madeiran civil parish of Sé, and is the southernmost point of Portugal. It was designated a natural reserve in 1971, recognizing its role as a very important nesting point for several species of birds. Since then, the decreasing bird populations (namely Cory's shearwater) and nearby waters have been more closely protected by the Portuguese government. Given its status, remoteness and few fresh water sources, it is inhabited only by reserve staff, scientists conducting research on its wildlife, a Portuguese family and a small Portuguese Navy detachment. In May 2016, a National Geographic Society scientific expedition prompted the extension of the marine reserve. Diogo Gomes de Sintra discovered the islands by chance in 1438. Although the Canary Islands had been inhabited by the Guanches, humans are not known to ever have set foot on the Madeira archipelago or the Savage Islands before the Portuguese discoveries and expansion. Consequently, this island group presented itself to Portuguese navigators uninhabited. The first attempted settlement of the islands occurred around 1438 by the Portuguese, although few details remain of this endeavour. The oldest extant description of the colonization was written around 1463 by the Portuguese mariner Diogo Gomes de Sintra. Gomes wrote that the islands were used to collect "ursellam", as a base for red paint/dyes; "ursellam" referred to the lichens of the scientific families Roccellaceae and Parmeliaceae. In those days, the islands of the Atlantic (the Azores and Madeira) belonged to Henry the Navigator, the Grandmaster of the Order of Christ (the Portuguese successor to the Knights Templar in Portugal). However, the islands were generally omitted from the lists of their possessions. By the 16th century the Savage Islands were held by a family from Madeira, known as Teixeiras Caiados. How the islands found themselves under Caiados control is unknown. In 1560 they were given to João Cabral de Noronha. After 1717 they are recorded in wills, inheritances, inventories and other documents. Between 1774 and 1831 taxes were paid to the king. The islands were also recorded in the books of the Conservatória do Registo Predial of Funchal. From the 15th to the 19th centuries, the islands were used for different economic activities, such as collecting barilla weed and shells and mollusks. The islands, although uninhabited, were also used as a waypoint for fishing, while goats and rabbits were hunted on Selvagem Grande. Until about 1967, in September or October, there were organized hunts for the chicks of the Cory's shearwaters for their oil and meat. The islands have a reputation as pirate treasure islands, and there are many stories of treasure hunting. According to reliable primary documents, at least four times (in 1813, 1851, 1856 and 1948), serious dig attempts were made to recover the supposed treasures but nothing was found. In 1904 the islands were sold to Luís Rocha Machado. The Permanent Commission of International Maritime Law gave sovereignty of the Savage Islands to Portugal on 15 February 1938. In 1959, the World Wildlife Fund (WWF), now known as the World Wide Fund for Nature, became interested in the islands and signed a contract/promise with the owner, Luís Rocha Machado. In 1971 the Portuguese government intervened and acquired the islands, converting them into a nature reserve. The Savage Islands Reserve was created as part of the Madeira Nature Park; it is one of the oldest nature reserves of Portugal and it also includes the surrounding shelf to a depth of 200 metres (220 yd; 660 ft). In 1976, permanent surveillance began, and in 1978 the reserve was elevated to the status of Nature Reserve. In 2002, part of the nature reserve was nominated for UNESCO's list of World Heritage Sites: they are currently included in the tentative World Heritage Site list. Today the Savage Islands have a permanent team of wardens from Madeira Nature Park (on Selvagem Grande there is a permanent research station with two wardens year-round, while Selvagem Pequena is manned usually by two wardens between May and October). These and the Zino family (a family of British origin, known as "the guardians of the Savages") are the only permanent human inhabitants on the islands. Selvagem Grande gained a weather station controlled by IPMA (the Portuguese Institute of the Sea and the Atmosphere) and is permanently patrolled by the Portuguese Maritime Police to improve safety in navigation, search and rescue, preventing pollution and stop illegal fisheries in the reserve. The self-sustaining status of the islands is disputed by Spain. Their habitability determines whether they should be seen as islands or rocks, which has strong consequences for the definition of the southernmost border of the Portuguese EEZ (with Spain), currently under evaluation by the United Nations' Commission on the Limits of the Continental Shelf. Northeast Group - includes the main island of Selvagem Grande (2,000 by 1,700 metres (6,600 ft × 5,600 ft)) and three small islets: Sinho Islet (Portuguese: Ilhéu Sinho), Palheiro do Mar, and Palheiro da Terra. Southwest Group - including the main island of Selvagem Pequena (800 m × 500 m (2,600 ft × 1,600 ft)) and Fora Islet (Portuguese: Ilhéu de Fora, 500 m × 300 m (1,640 ft × 980 ft)), also called Great Piton and Little Piton respectively, it is surrounded by a group of very small islets (Alto, Comprido and Redondo) and a group collectively known as the Northern Islets (Portuguese: Ilhéus do Norte). The islands' physical characteristics are the consequences of mountain-forming and volcanic forces that occurred between 60 and 70 million years ago, typical of many of the islands of Macaronesia. The islands were created during the late Miocene period, from a large submarine volcano and shaped by erosion and marine sedimentation. The larger islands and islet (Grande, Pequena and Fora, respectively) are the remnants of the peaks of these submarine mounts, and although located north of the Canaries, they were never connected to the African continent. The islands themselves are crossed by many calcareous faults, some marbleized, and made of basaltic rock, ash, and other volcanic materials. On many of the islands there are remnants of extinct cones, such as Atalaia (Selvagem Grande), Tornozelos and Veado. Other areas are sand covered from extensive aeolian, fluvial and marine erosion; headlands include Atalaia and Leste on Selvagem Grande, and Norte, Oeste, Leste and Garajaus on Selvagem Pequena. The scientific and natural interest of this tiny group of islands lies in its marine biodiversity, its unique flora and many avian species that breed annually on its rock cliffs or use them on their stopover on normal migratory patterns. About 3% of the birds species are resident species, the remaining are migratory species. The abundance of birds on the islands, at one time, made the islands an attractive hunting area for peoples of the region. At the end of the 19th century the German naturalist Ernst Schmitz noted that 20–22,000 Cory's shearwaters were hunted in September or October in the islands; the hunts continued until 1967. Madeiran expeditions to the islands were responsible for the killing of juvenile birds for food, while their down was used to stuff pillows and comforters. Presently the islands are home or stopover for: Cory's shearwaters (approximately 14,000), white-faced storm-petrel (12,000), Bulwer's petrel (500), North Atlantic little shearwater (500), Madeiran storm-petrel (1000), yellow-legged gull, the roseate tern and Berthelot's pipit; which are subjects of annual scientific expeditions. Many of these species are vulnerable to local predators, primarily from populations of brown rat and predatory bird species, like the yellow-legged gull, which will consume both eggs and chicks (the white-faced storm-petrel and Bulwer's petrel are primarily susceptible). These islands also have many endemic fauna species, including local snails and the unique gecko Tarentola boettgeri bischoffi. As a consequence of limited introduction, more than 100 species of indigenous plants have been catalogued (most creeping plants and bushes). These plants are similar in many respects to indigenous species on the islands of Madeira and the Canaries, which are better suited to dry arid environments. Germination of these species occurs immediately and briefly after annual showers, and include: Mesembryanthemum crystallinum, Lotus glaucus subsp. salvagensis, Chrysanthemum sarmentoi, Scilla maderensis, Argyranthemum thalassophilum and Lobularia canariensis. Selvagem Pequena and the Fora Islet are the richest floral repositories, since they were never populated by non-indigenous animals or plants. For a period, some indigenous species (primarily Roccella tinctoria and other lichens of the family Nemari) were harvested from the islands to support the dye industry of Europe, primarily to England and Flanders in the 15th and 16th centuries, but these adventures were discontinued later. Jacques-Yves Cousteau once found what he believed was "the cleanest waters in the world" around this minor archipelago; there is an abundance of marine activity, much endemic to the environment, including the barred hogfish, puffer fish (Tetraodontidae), sea spider and many species of sea urchin. At depth of about 30 m (100 ft) the waters around the islands/islets are teeming with algae and many migratory species of common fish, routinely migrating from the islands of Cape Verde, Madeira and the Canaries. Although commercial tours of the islands and their biomes are available, all visitors require authorization from the Madeira Nature Park, the regional environmental authority. Portugal places its southernmost Exclusive Economic Zone claim south of the Savage Islands. Spain objects on the basis that the Savage Islands do not have a separate continental shelf, maintaining that the border should consist on an equidistant line drawn halfway between Madeira and the Canaries. According to article 121 of the United Nations Convention on the Law of the Sea: "Rocks which cannot sustain human habitation or economic life of their own shall have no exclusive economic zone or continental shelf." The status of the Savage Islands as islands or rocks is thus at the core of the dispute. Despite the islands having numerous visitors, mostly for scientific purposes, and the fact that several settlements were tried throughout the centuries[dubious – discuss], today the Savage Islands are a special natural reserve whose only year-round inhabitants are the wardens of Madeira's Natural Park. Over the years, apart from the EEZ debate, a number of issues pertaining to the Savage Islands led to disputes between the two countries, namely the construction of a lighthouse, the administration of airspace (done from the closer Canary Islands), the right to perform military air exercises, and, most importantly, illegal fishing and poaching in the archipelago and its vicinity. 1880s – In an 1881 Maritime Signalization Commission meeting, Spain requested the building of a lighthouse on the islands. The Portuguese recognized the importance of the lighthouse to the Canary Islands sea route, but deemed it not a priority at the time. In response, the Spanish Foreign Affairs Ministry stated that "...the sovereignty of the islands is unclear". 1910s – In 1911, given the lack of action over the requested lighthouse, Spain said it would build it on its own (and annex the archipelago). After a Portuguese protest questioning what it termed "Spanish confusion" over the issue, Spain said its intention was to reach an agreement "in the most amicable terms". In 1913, the Portuguese Navy conducted a survey, led by Admiral Schultz Xavier, of the Selvagem Grande Island and recommended Pico da Atalaia as the best location for the lighthouse. 1930s – On February 15, 1938, the Permanent Commission of International Maritime Law declared Portugal as the legitimate sovereign over the islands on February 15. The Spanish government, however, was in the midst of fighting the Spanish Civil War and did not have the opportunity to present its case to the Commission. 1970s – In 1971, the Portuguese government bought the islands from their previous Madeiran owner, and decreed the creation of a natural reserve in the archipelago to protect the area from illegal fishing and poaching, which had severely reduced the bird populations in recent years. In 1972, two Spanish civilian boats, San Pedro de Abona and Áries, were arrested near the islands. In 1975, fishermen from the Canary Islands disembarked in the islands and waved a Spanish flag. In 1976 another Spanish boat, Ecce Homo Divino, was detained for illegal fishing. 1996-1997 - On 8 April 1996, Spanish F-18 fighters overflew the islands, followed by a low altitude Puma SA-330J flyby over Selvagem Grande on August 2nd. On the following October 16th, another F-18 flyby over the reserve was filmed by the Portuguese RTP TV channel, prompting the Portuguese Foreign Affairs Ministry to protest. In May 1997, the Ministry of Defense formally requested the Spanish government to stop training exercises near the natural reserve. Spain agreed, but on 1 August 1997 and 24 September 1997, new flybys by Spanish airplanes took place in the vicinity, prompting vehement protests from the Portuguese authorities which led to a formal apology by the Spanish ambassador to Portugal, after which the flights stopped. After this period, the islands were reinforced with a small Portuguese Navy detachment, purportedly to help patrol the islands against illegal fishing and poaching. Later in 1997, Spain formally recognized Portuguese sovereignty over the islands. 2005 – 23 June, four Spanish fishing boats were detained 28 nautical miles (52 km; 32 mi) south of the islands. A few days later, on 8 July, a biologist and one of the nature reserve wardens in the Selvagem Grande Island were threatened with a knife and underwater fishing spear guns by a group of Spanish fishermen. A group of ten Portuguese marines were placed on the island for a month to put an end to poaching of protected species. 2007 - June, one Spanish search and rescue airplane flew over the islands at low altitude, prompting the Portuguese Ministry of the Environment to contact its Spanish counterpart over the issue. 2013 - 5 July, Spain sends letter officially complaining to the UN that the Savage islands are just rocks, which would invalidate the Portuguese sovereignty of over 700 years of the islands. 2013 - 18 July, The serving President of Portugal, Aníbal Cavaco Silva with the President of the Regional Government of Madeira, Alberto João Jardim arrived on the islands on board the Portuguese Navy frigate "Vasco da Gama" visit and stay on the Islands as part of a tour to meet residents and officials based there. Aníbal Cavaco Silva became the first President to stay overnight on the islands as former Presidents Mário Soares and Jorge Sampaio only visited for a few hours. 2014 - The head of the Spanish Government, Mariano Rajoy, announced that Repsol, an Oil and Gas company will conduct surveys to find oil and gas in the surrounding waters of the nearby Canary islands, would begin "very likely" between July and September. 2014 - 22 September, Canarian secessionists on behalf of the Canarian Nationalist Alternative party, stage a protest on the smaller island of Selvagem Pequena, to urge the Portuguese government to intercede with the European Parliament so as not to jeopardize the fragile and unique biodiversity of the Macaronesian islands, before the Spanish government completely surrenders to the interests of Repsol. After two days the protestors were transported to Funchal by the Portuguese Navy. 2014 - 17 December, Spain sends Dr Luis Somoza Losada to the UN to give a 448-point report asking for the expansion of Spanish territory at the expense of Portugal. After returning to Spain from New York he states "It's the biggest enlargement of Spanish sovereignty since Christopher Columbus". Luis Somoza Losada was a coordinator of a team made up of civilians and military that was commissioned to underpin the ambitious maritime expansion of Spain around the Savage Islands. Conducting 6 surveys of the area on 3 ships: the Hespérides, Miguel Oliver and Sarmiento de Gamboa, he discovered that there was gas in the area and possibly oil. 2016 - 21 August, the territory starts being permanently patrolled by two elements of the Polícia Marítima, the Portuguese water police. 2016 - 30 August, Portuguese President Marcelo Rebelo de Sousa, joined by the Minister for Internal Administration Constança Urbano de Sousa, and the President of the Regional Government of Madeira Miguel Albuquerque, visited Selvagem Grande. Rebelo de Sousa remarked that "Wherever the President of the Republic goes, he marks our territory", and justified the voyage by saying that the Head of State must go to every part of the national territory. 1970 – On 21 July the Italian ship Fluvia sank close to the islands. 1971 – The Norwegian oil tanker Cerno deviated from course to the islands to wash the tanks and ran aground on the Selvagem Pequena Island. Three months later the oil tanker Morning Breeze sank near Selvagem Grande Island. 1973 – The merchant vessel Splendid Breeze sank near the islands. 1976 – A yacht named Demeter sank near the islands. ^ a b "Família Zino, a guardiã das Selvagens (in Portuguese)". DNoticias. July 16, 2013. Retrieved 1 June 2015. Ritsema, Alex (2010). 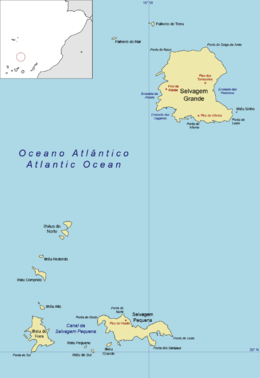 The Selvagens, Forgotten Atlantic Islands. Raleigh, North Carolina: Lulu Press. ISBN 978-1-4461-8968-9. Albuquerque, Luis; Vieira, Alberto (1988). The Archipelago of Madeira in the 15th Century. Funchal, Madeira: Centro Estudos História Atlântico.